The Regional Indigenous Cancer Care Lead role is to champion the Aboriginal Cancer Strategy vision and goals in collaboration with the Regional Cancer Program, identify and respond to systemic issues relevant to First Nations, Inuit and Métis (FNIM) healthcare needs, ensure that a primary care perspective relevant to FNIM people is included within regional strategic planning and program design, in addition to forming partnerships with FNIM organizations across the Region to increase screening participation. 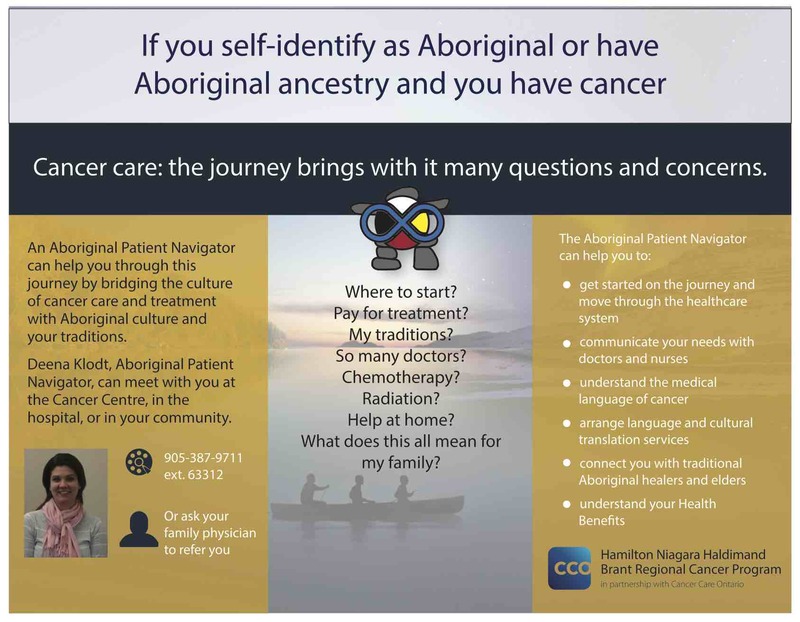 The Indigenous Patient Navigator provides support and advocacy for First Nations, Metis and Inuit (FNIM) patients and families by facilitating and coordinating access to cancer services for palliative and supportive care, addressing cultural and spiritual needs, and networking with FNIM and non-Ondigenous partners to make the cancer journey a culturally safe experience. To contact the Indigenous Patient Navigator, call 905-521-2100 ext. 63312. To learn more about this role, click here. The Indigenous Outreach Worker involves reaching out to FNIM peoples across the Region to provide cancer prevention education, increase cancer screening knowledge and refer people to the Regional Indigenous Patient Navigator when appropriate. There are cancer screening centres close to Six Nations of the Grand River and Mississaugas of the Credit First Nation. Urban FNIM peoples can also visit any of the breast screening locations close to where they live or see their healthcare provider for more information. To find breast screening locations please click here.